Began Western violin lessons at age 5 immediately following the Cultural Revolution. As elementary school student, passed first audition following the Cultural Revolution for entrance into Shanghai School of Music. Majored in Western violin and erhu in university, graduating with honors in both.Came to Japan in 1991. In order to explore the playing of new varieties of music beyond the traditional erhu repertoire, began active collaboration with a variety of musicians, including Funky Sueyoshi (of Bakufu Slump fame) in a new band named Five Star Flag. Developed world’s first electronic erhu and, in addition, style of playing while standing (in contrast to traditional style of playing the erhu while sitting). 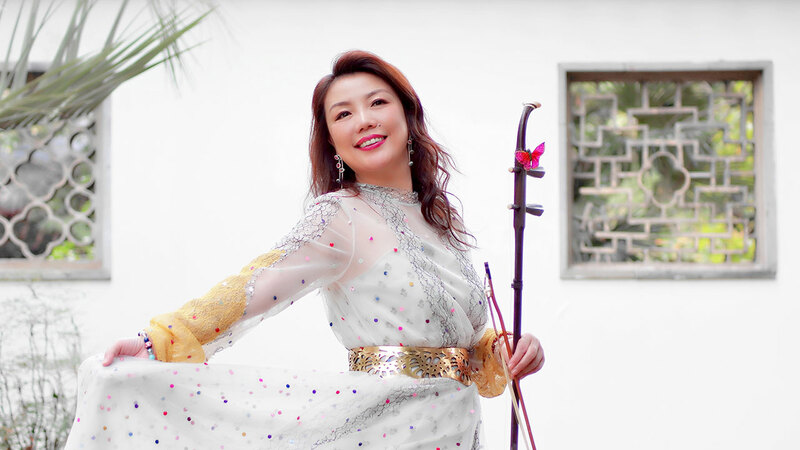 Has explored various music genres including classic, rock, jazz, and fusion, establishing herself as a pioneer of modern erhu performance and recording. 2003: played Japanese national anthem for season baseball opener at Seibu Stadium; performed for first time on NHK (many performances since). 2004: performed with Ryuichi Sakamoto; recorded hit album based on music of Burt Bacharach. 2005: recorded music for Suntory oolong tea commercial (“Changing Partners” by Patti Page). 2006: released “Nomad”—a concept album featuring a variety of music from around the world. 2007: recorded theme music for NHK TV show, “Darwin”; recorded with Kenny G and performed as guest with Kenny G at Kenny G’s Tokyo concert; released “China Blue” album, winner of Adlib Award. 2008: released “Tears” album, focusing on classical pieces. 2009: performed with other world-renowned erhu players at an erhu “summit” in Tokyo; recorded theme music for “Jin,” a TBS drama series; recorded music for “Doraemon” movie and “Sengoku BASARA” video game. 2010: released “Back to the…” album; performed at Shanghai World Expo. 2011: continues, as a modern erhu pioneer, to explore the potential of the erhu far beyond its traditional scope, collaborating with Japanese and international artists. Ms. Wuu continues her a busy performance schedule in Japan, including dates at some of Japan’s foremost jazzhouse venues, such as Tokyo’s Sweet Basil and the Osaka and Nagoya Blue Notes. In addition to her own performances, she has had live and television appearances with some of Japan’s and the world’s leading and best-known jazz musicians, including Ryuichi Sakamoto and Kenny G.
On March 29th,2007 Wei Wei Wuu made her first live appearance in Los Angeles – at The Baked Potato – with a performance including original cuts and interpretations from “Nomad,” her 4th solo album (released in January) on the Warner Japan label. Each of WeiWei’s albums feature her own original cuts as well as unique interpretations of works from various genres, including jazz, classical, 60’s Euro-Contempo, world music, and Chinese popular (standards from the 1920s and later) – all suffused with her distinctive style. Ms. Wuu’s approach espouses a dynamic eclecticism in which various musical genres synergistically augment the expressive power and subtlety of one another to form an at once contrapuntal, powerfully harmonious whole. WeiWei Wuu offers listeners a mind-opening experience in the possibilities offered by today’s global music environment. In her performances, compositions, and recordings, she argues convincingly for a musical aesthetic which combines a bold, ecstatic enthusiasm with a discipline of technical rigor and an intimate awareness of the global musical legacy. Ms. Wuu’s albums and live performances have received praise in Japan’s print media while also generating a number of well-received Japanese radio and television appearances, including on NHK television’s Channel 1, Japan’s flagship station. Fire and ice; grace and raw emotive power; multi-faceted expressiveness and simplest purity of sound: admirers – whether media or fans – routinely use descriptions such as these to evoke the breadth and depth of Ms. Wuu’s music. Ms. Wuu attributes the foundation of her success to a rigorous musical schooling under the direction of her father, a well-known composer in Shanghai. “At the height of the Cultural Revolution, when I was five years old, my father had me practicing Western violin everyday–we had to draw the curtains in order to attract as little attention as possible to the fact that I was studying Western music.” Even at a young age, Ms. Wuu drew notice, receiving praise from the violinist Isaac Stern during his first visit to China in the Cultural Revolution’s wake. Her principal teacher at the nationally-prestigious Shanghai College of Theatre Arts (where Ms. Wuu studied both erhu and Western violin) remarked that a distinctively powerful energy has always been one of Ms. Wuu’s hallmarks among Chinese erhu players. This energy, a delicacy and creativity in phrasing and tonal expression, and an abundance of musical imagination lie at the center of Wei Wei Wuu’s formidable abilities.